It’s easy to get distracted when writing your business’s core strategy. Business owners and business unit leaders can miss key observations inside their organizations to help lead the way with an effective strategy. Core competencies is a top indicator to help drive your strategy. The Harvard Business Review has a series of explainer videos and I found the one on core competencies to be a wonderful quick reference guide. It explains core competencies as what your organization knows and how it performs coordinating production and technology for multiple business units. HBR says it’s the strength of the business and impossible to compare when reviewing competitor products or end results. Core Competencies are the 5 or 6 things you do better than anyone else in the market. It provides access to a wide variety of markets based on your proprietary knowledge and process. It’s hard to imitate by competitors. It’s your secret sauce. Not only do core competencies bind existing business units they also help build and grow new business units while prevent outsourcing disasters trying to replicate a competitors core competencies or shortchanging a nugget of your process that contributes to your core competencies. In my book, Ruthless Focus, part of my concluding lessons refer to the formula systems + people + culture = profit. 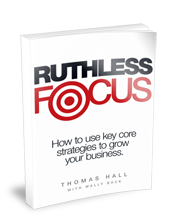 You can read how these basics fit in this formula and study a dozen company examples on having a ruthless focus on your core strategy. Get a copy on Amazon.